Roulette Tables: Professional Wood Roulette Tables, Hand Crafted in the U.S.A.
Our ROU2910 Roulette Table features overall hard wood construction, a padded felt playing surface in the color of your choice (choose the layout shown or a standard casino-green, blue, or burgundy layout), a money slot, and a removable padded armrest. 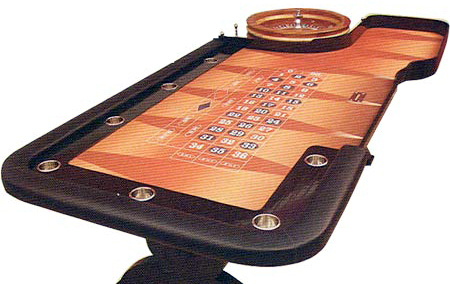 Each of these Casino-Quality Roulette Tables also features a unique leg design plus a wood insert with seven built-in cup holders. The ROU2910 Roulette Table measures 96"L x 55"W and can accommodate a 19" to 27" roulette wheel (sold separately). For additional information on our ROU2910 Wood Roulette Table, please contact us at 1-800-233-0828. You might also be interested in our Eight-Foot ROU6909 Casino-Style Roulette Table, our Nine-Foot ROU1200 Roulette Table, and our selection of Roulette Supplies.